Add banner ads above, below and/or on either side of your contest. Sell naming rights to the contest. A pet contest sponsored by a particular groomer might be referred to as the "ABC Groomers Cutest Pet Contest" on the contest page and in all other promotional materials. For sports pick'em contests, add your sponsors as VIP pickers, and feature their photos on the welcome page. Check out this pro football pick'em designed by The Florida Times-Union. The paper's top sponsor, Dream Finders, is featured throughout the contest page, including hyperlinks to its business webpage. Second tier sponsors also are heavily featured. Be sure to include a Facebook Like Box to encourage growing Facebook followers. Post about the contest on your Facebook page, including an image with your sponsor's logo and a shortlink to the main contest page. 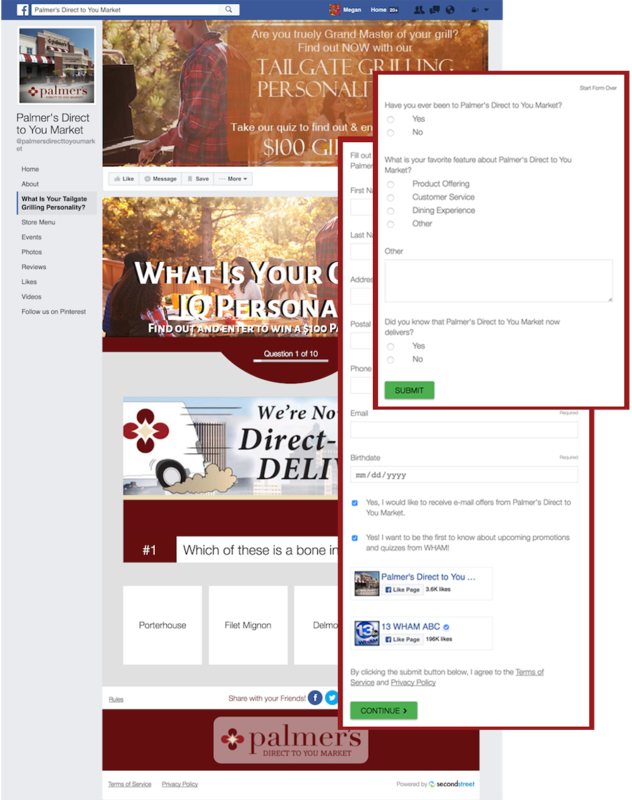 Make your Facebook contesting tab visible and brand it with your contest's header graphic. Post again when the contest ends congratulating the winner and linking to your sponsor's site. While you can promote the contest with your Facebook Cover Photo, you are NOT allowed to include the sponsor's logo as this violates Facebook's Terms of Service. You could also promote the contest on Twitter, Pinterest, Instagram or other social media if it makes sense – of course, always include sponsor mentions and links to the sponsor's own social media accounts. WHAM-TV created this "What's Your Tailgate Grilling Personality?" quiz for its sponsor, Palmer's Direct to You Market, a local meat market. The station ran the contest on the advertiser's Facebook Page and totally customized it to produce a ton of value for the sponsor. Send a registration confirmation email with sponsor logos, links to the sponsor's site, and a coupon or offer if possible. Include your sponsor's information in weekly reminder emails for sports pick'em contests or any emails announcing that the submission period is ending or voting beginning. Include the sponsor's information in a follow-up email announcing the winner after the contest. If the prize package came from the sponsor, make this clear. A strong email campaign led to great success for the Steamboat Pilot's sweepstakes for a local yoga festival. The advertiser was incredibly pleased and over 100 registrations came from the bounceback email. Place promo ads for the contest – including the sponsor's logo – around your site. Include your sponsor's logo on any peel-aways, sliding billboards or feature carousels advertising the contest. 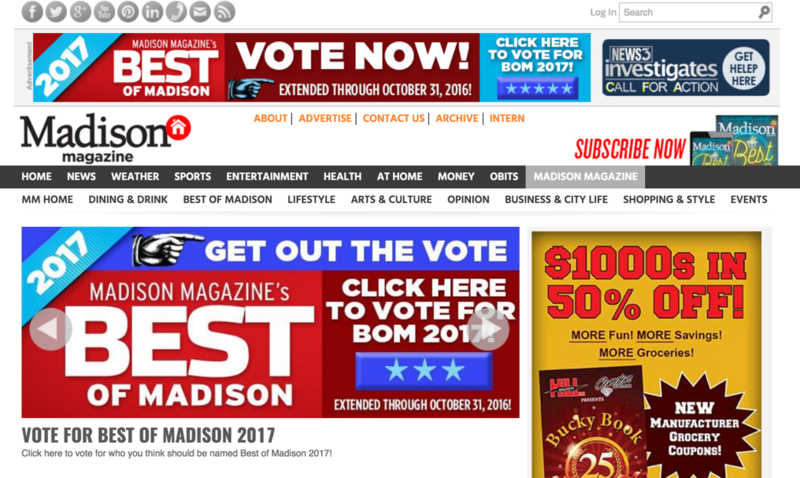 Madison Magazine gave its ballot prime real estate all across the website. The promotional strategy led to a windfall of votes from the community. Place print ads with your sponsor's logo, or include your sponsor's name in any on-air mentions. Place your sponsor's information or an ad for your sponsor in any relevant special sections or programming. Feature VIP pickers – including your sponsor – in print or on-air each week for sports pick'em contests. Every year, The Atlanta Journal-Constitution dedicates a large portion of its print publication to publicizing its basketball bracket. This is a huge opportunity for branding for the sponsor and drives a ton of awareness about the contest.